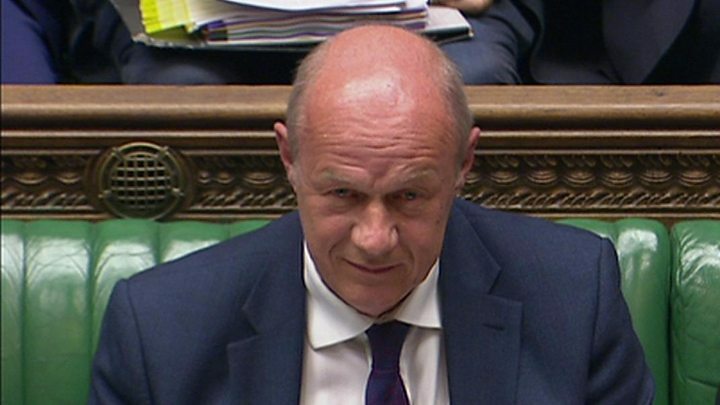 Media captionDamian Green on Labour's EU stances: "They have so far, I have counted, had nine different plans on Europe"
The risk of the UK leaving the EU without any kind of deal is "probably overstated", Damian Green has claimed as he deputised for Theresa May at Prime Minister's Questions. The first secretary of state said both sides wanted a successful outcome. But Labour's Emily Thornberry said the Tories were "in a mess" over Brexit and urged ministers to "get a grip". She suggested there were contingency plans for any failure to get a deal but the public were being left in the dark. The prime minister missed Wednesday's session because of the King and Queen of Spain's state visit to the UK, while Ms Thornberry stood in for her party leader Jeremy Corbyn. At the penultimate session before the summer recess, the shadow foreign secretary seized on what she said was confusion in the cabinet over whether the government was ruling out, or not, the UK leaving the EU in 2019 without any kind of agreement. Media captionEmily Thornberry asks Damian Green: "What does 'no deal' look like in practice?" On Tuesday, Foreign Secretary Boris Johnson suggested there was no planning for such a scenario, seemingly contradicting previous comments by ministers. Ms Thornberry said Mr Johnson appeared to be "making it up as he is going along" while the prime minister - who has said she wants to work with other parties on a range of issues - was "so bereft of ideas that she is starting putting suggestion boxes around Parliament". "Isn't the truth now that we have got a no deal option on the table but they won't tell us what it means, they have got contingency plans but they won't let the public see them," she said. "As a country, we have got 20 months to go before Brexit, we absolutely have got to get a grip." Mr Green said the UK wanted an agreement but retained the right to walk away if it was offered a "punishment" deal that was bad for the country. He suggested Labour would accept any offer from the EU, suggesting its approach to the talks was one of "unilateral disarmament". "So far from the Labour Party they have had, I have counted, nine different plans on Europe. Labour want to be both in and out of the single market, in and out of the customs union. They said they wanted to remain and voted for Article 50." In contrast, he said the UK's "reasonable" offer on citizens' rights showed the government was getting on with the task in a "practical and pragmatic" way. He also rejected suggestions ministers were hiding information from the public about the economic consequences, saying the Office for Budget Responsibility would publish a report on Thursday about the likely fiscal risks and opportunities from Brexit. Mrs May was not in the Commons as she attended a special event in Horseguards Parade to mark the beginning of King Felipe and Queen's Letizia's state visit to the UK. By convention, when the PM is absent, the opposition leader also stays away. Mr Green was promoted to first secretary of state in a mini-reshuffle after the general election. The MP, who has known Theresa May since they were contemporaries at Oxford University, is now regarded by some as Mrs May's de facto deputy and has adopted a high profile in recent weeks defending the PM and the Tories' pact with the Democratic Unionists. The MP for Ashford, who is also Cabinet Office minister, was policing minister for four years in the coalition government but was sacked by David Cameron and had a spell on the backbenches between 2014 and 2016. On the only other occasion that Theresa May has been absent from PMQs during her year in power, her stand-in was former leader of the House of Commons David Lidington. Mr Lidington has since become justice secretary. 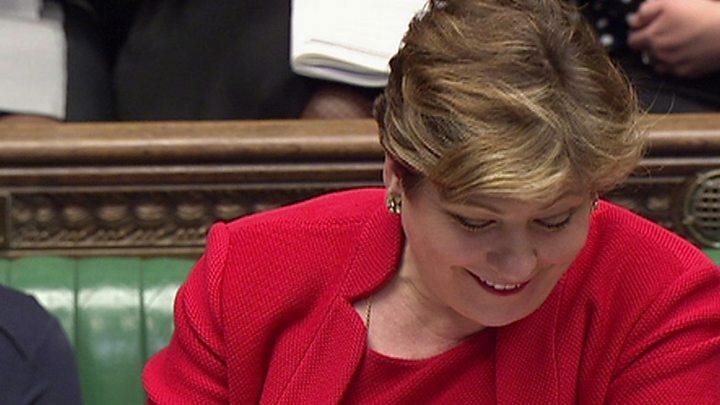 Emily Thornberry, who is shadow first secretary of state as well as shadow foreign secretary, will be making her second appearance at PMQs. The MP for Islington South took over from Angela Eagle as shadow first secretary after last year's EU referendum.